In a first, the Banaras Hindu University (BHU) on Thursday appointed a woman as its chief proctor, media reports said. The appointment of Professor Royana Singh comes at a time when the university is under the scanner for compromising women's safety and two days after the resignation of her predecessor ON Singh. Royana who is part of the anatomy department of the Institute of Medical Science. According to The Hindu, Royana is the chairman of the Women's Grievance Cell of the BHU. Former proctor Singh had offered his resignation to BHU vice-chancellor GC Tripathi after taking moral responsibility for the incident of lathi-charge on students who were protesting against the victim-blaming of a colleague who was molested on the campus. The police were criticised for resorting to lathi-charge and beating up female students. The police, however, claimed that the students had resorted to violence. Female students in the university, however, have said that the Singh was made a scapegoat and that Tripathi who should resign instead. On Wednesday, BHU's dean of students, MK Singh had taken additional charge as a proctor until a formal appointment for the post. To make amends, the BHU vice-chancellor also announced his decision to appoint senior girl students of the physical education and sports departments as women security personnel under the "earn while learn" scheme of the university, The Times of India reported. Despite the fact that a spate of decisions been taken recently showing the inclusion of women into university affairs, the atmosphere on the campus of the 101-year-old BHU in Uttar Pradesh's Varanasi continues to remain tense. 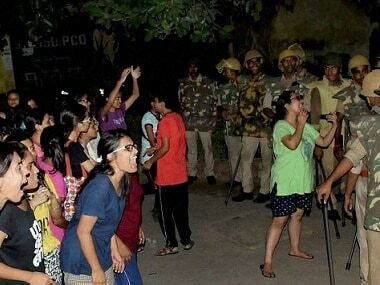 A woman student was beaten up by police personnel during the protests on 23 September night when students demanded to meet the vice-chancellor. Speaking on the violent protests on the campus, Tripathi had stirred up the hornet's nest when he told The Indian Express that if the complaints and demands of every girl were to be listened to, he will not be able to run the university. The Times of India report also said a high-level official report on the recent violence and arson in the BHU noted that proper and timely communication with protesting girl students by the varsity administration could have prevented the problem from escalating. Despite his explanations, the BHU vice-chancellor, who is in the Opposition's line of fire and has made some controversial comments, allegedly trivialising the molestation incident, is in the eye of the storm. The BHU vice-chancellor was also quoted as saying, "Boys will be boys," and "Forget about what happened. Why don’t you stop stepping out after 6 pm if you dislike such things? You are a girl, don’t try to become a boy (by stepping out after sunset)." The vice-chancellor also justified strict curfew timings in girls' hostel and alleged gender biases by saying that the security of girls and boys can never be at par.